With a busy harbor and a vibrant urban energy, Marseilles appeals to visitors seeking an authentic tourist experience. This cosmopolitan city is France's oldest and the second largest after Paris and has much to offer, from ancient history and cultural diversity to gorgeous seaside scenery. Everywhere in Marseille, visitors are close to the serene blue waters - whether walking along a charming old street with a view, or feeling the refreshing sea breeze. The city's colorful, multiethnic heritage also makes Marseille a fascinating place. Considered the bridge between Europe and North Africa, Marseille is home to a sizable emigrant population from Algeria. It's possible to find traditional Arab souks as easily as a classic French bouillabaisse. In a breathtaking hilltop location, this spectacular church stands on the summit of Marseille as its most important landmark, visible from afar. The site was used in ancient times as an observation point, and during the Middle Ages, was the location of a pilgrimage chapel. Today, the Basilique Notre-Dame de la Garde is a beacon for the faithful, with an enormous gilded Madonna crowning the belfry. Built in 1853-1864, the church features an opulent Neo-Byzantine-style interior of light and dark marble arches supporting gilded mosaic cupolas. The lavish design has a mesmerizing effect. In the crypt, there are votive tablets and model aircraft given by aviators. After seeing the interior, visitors can spend time on the splendid terrace. Offering a marvelous view, the panorama extends from the red roof tops of Marseilles' buildings and the old harbor, all the way to the Frioul Islands in the Mediterranean Sea. Dedicated to the martyr Saint Victor, this house of worship once belonged to an abbey founded in the 5th century. The foreboding exterior has the feel of a medieval fortress, and the church has a special aura because of its ancient beginnings. The foundations of the church date back to Early Christian and Carolingian times, although the turreted towers are from the 11th and 14th century. In the crypt, there is the original catacomb chapel and the Grotto of Saint Victor. The basilica also has a 13th-century Black Madonna. Being one of the oldest buildings in Marseille that is still intact, the Basilica Saint is a must-see tourist attraction. The Vieux Port represents the birthplace of Marseilles. 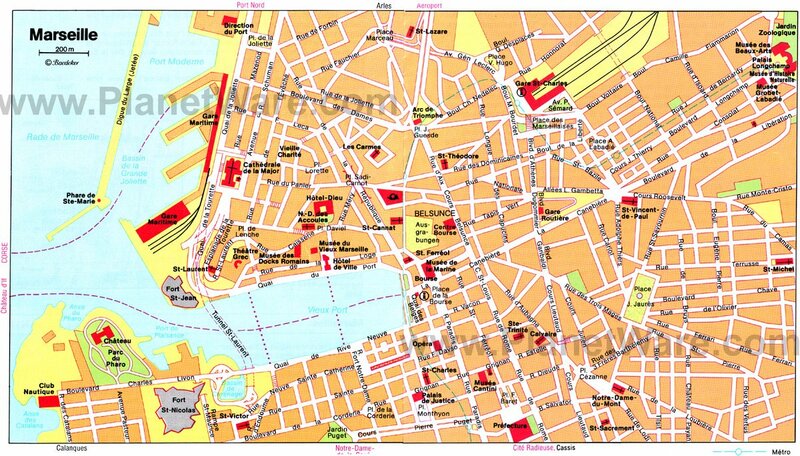 This is where the city began as a Greek port around 600 BC. Surrounded by serene blue waters, the Old Port is located in the west of Marseilles near the Canebière boulevard. A stroll around this ancient harbor gives visitors a feel for the thriving Mediterranean atmosphere of Marseilles. The lively waterfront is a focal point for tourists, and many say that this area is the best place to find authentic bouillabaisse, the flavorful seafood stew that is a specialty of Marseille. On the east side of the harbor, the Quai des Belges hosts a fish market every morning. Once an important commercial port, the Vieux Port is now used primarily by fishing boats and sports craft. The Old Port is also the launching point for the ferries that sail to two popular tourist destinations: the Château d'If and the Calanques near Cassis. Splendidly situated on a hillside above the Vieux Port, this colorful neighborhood is the historic center and cultural heart of Marseille. Le Panier is Marseille's oldest quarter, inhabited since antiquity when the ancient Greeks settled here in 600 BC. With its steep, narrow winding streets and quaint pastel buildings, this quarter offers a glimpse into the charming personality of Marseilles. Once a working class neighborhood, Le Panier is now gentrified, but still has a fascinating multiethnic and artistic character. You'll find plenty of authentic Algerian cuisine, local artisan boutiques, gourmet food shops, and art galleries. This quarter is also a residential neighborhood, and the typical houses with shuttered window and lines of laundry provide evidence of the families who live there. Visitors may begin a walking tour on the north side of the Vieux Port harbor basin at the Quai du Port and then walk up La Canebière, a vibrant boulevard that buzzes with activity. The quarter has several important monuments such as the Hôtel de Ville (Town Hall), which was built in the second half of the 17th century based on a Genoese architectural model. Other landmarks include the Cathédrale de la Major and the Vieille Charité, which has a museum with interesting contemporary art exhibits. A stunning complex of three different sites, this expansive museum features a wealth of discoveries. Through the museum's galleries as well as lectures and film screenings, visitors can explore the history of Mediterranean civilization. The newest part of the museum is built on the former J4 Pier by the architect Rudy Ricciotti. This section addresses themes such as the invention of gods, the treasures of the spice route, the visions of Jerusalem, and the seven wonders of the world. The second stage of the museum is located in the vaulted rooms of the Fort Saint-Jean, a historic monument that dates back to the 12th century. The Fort Saint-Jean also has spectacular Mediterranean gardens accessible by a suspended footbridge over the sea. Here, visitors can enjoy a scenic stroll and take in the panoramic views of the coastline. The third site is the Conservation Center (located in the Belle de Mai quarter), which offers a behind-the-scenes look into the work of the museum. The Parc National des Calanques offers the splendor of nature just 15 kilometers away from Marseilles on the way to the quaint fishing village of Cassis. Located where the Mediterranean meets the Massif des Calanques mountains, the unique landscape is distinguished by majestic limestone rock walls with fjord-like coves ("calanque" translates to "cove"). The peaceful coves are filled with calm pools of saltwater that flows to and from the sea. Visitors are dazzled by the water's mesmerizing turquoise color as well as by the diverse plant species and rare wildlife, including the peregrine falcon. Outdoor sports enthusiasts will find many things to do at Calanques National Park, such as swimming, kayaking, rock climbing, and hiking. An excellent system of trails allows visitors to appreciate the pristine environment and gorgeous coastal views. For those who enjoy yachting and boat cruises, the fjords provide spectacular scenery on an idyllic journey through the tranquil maritime environment. 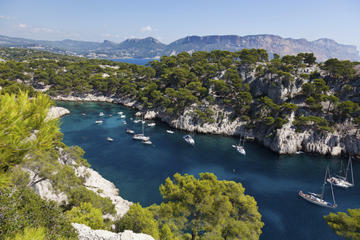 The largest calanques, Port-Miou, En-Vau, and Port-Pin, can be reached by car or by ferry from Marseilles. It is also possible to take a guided boat tour or arrange a private boat trip. The Château d'If is a worthwhile attraction because of its history and natural setting. A short ferry ride away from the port of Marseilles, the Château d'If is located on the Ile d'If in the Frioul Islands archipelago, a nature conservation area that includes the tiny islands of If, Pomègues, Ratonneau, and Tiboulen. The scenery is spectacular with protected coves, turquoise waters, pristine beaches, sandy creeks, and impressive limestone cliffs. Thanks to the Mediterranean sunshine, the light creates a spectacular effect on the water, and a microclimate allows rare floral species to flourish. In this beautiful location, the Château d'If was built as a fortress by King François I in the 16th century. Soon after, the fortress was converted into a prison. In the 17th century, when Protestants were still imprisoned en masse, the Château d'If provided relatively decent conditions for those imprisoned here. The setting was also featured in Alexandre Dumas' novel The Count of Monte Cristo. In Le Panier quarter, just a few steps away from the Vieux Port, the Musée d'Histoire de Marseille tells the story of Marseilles from its Gallo-Greek origins through the Middle Ages to the present day. Fitting for the oldest city in France, this museum offers an impressive collection of historical artifacts. The extensive collection covers 2,600 years of history. Housed in a sleek modern building, the collections come to life in the museum's bright spacious rooms. One of the highlights of the collection is the hull of a third-century Roman ship. The museum also has a park, the Jardin des Vestiges, which is an open-air museum for an excavation site. In the gardens, visitors can see the ruins of the ancient port of Massalia from the third-century BC. The Vieille Charité is located on the Place des Moulins that lies at the highest point in Le Panier. The building was created in 1640 when the Marseille Town Council decided to give the poor local inhabitants a decent place to reside, in compliance with a royal policy of "enclosing the poor." In 1749, a three-floor public hospital with four wings was added to the building. There is a chapel at the center courtyard of the hospital complex. Built from 1679 to 1707, the chapel is a wonderful example of Italian baroque architecture. The facade of the Vieille Charité is more modern, dating from 1863. Upon close observation, visitors will notice the depiction of two pelicans feeding their young, to represent Charity looking after poor children. Since 1986, the Vieille Charité building has been used to host scientific and cultural events and to house a museum, the Centre de la Vieille Charité. This museum offers excellent contemporary art exhibitions throughout the year. Beside the sea on a terrace in the northwest of the Le Panier quarter, the Cathédrale de la Major of Marseille boasts a picturesque location fitting of this port city. The mighty cathedral stands high above the port installations, with its impressive domed towers-the highest rising 16 meters. Constructed between 1852 and 1893 using a mixture of white and green limestone, the Cathedral blends Romanesque and Byzantine styles to a harmonious effect. The interior is richly decorated with marble and mosaic; in the crypt lie the tombs of the Bishops of Marseilles. With a length of 141 meters, the Cathédrale de la Major is the largest ecclesiastical building created in the 19th century. Luxury Hotels: Residence du Vieux Port, with port-facing rooms also offering views of the grand Basilique Notre Dame de la Garde across the harbor, is close to the Metro and shopping. High in Le Panier, InterContinental Marseille - Hotel Dieu has a pool, spa, and a Michelin-starred restaurant in addition to its old-world elegance. Out a short distance on the quieter east side of the port, Sofitel Marseille Vieux-Port is close to the Abbaye Saint-Victor and has a seasonal pool, a sauna, gym, and brasserie. Mid-Range Hotels: Right on the harbor at the head of the old port, Escale Oceania Marseille Vieux Port is perfectly located for visiting the annual Santon Market in December, with balconies overlooking the square. Radisson Blu Hotel, Marseille Vieux Port, not far from the Abbaye Saint-Victor, has a pool overlooking the port. Grand Hotel Beauvau Marseille Vieux Port - MGallery Collection is close to the Metro station, ferry landing, and Musée d'Histoire de Marseille. Budget Hotels: At the edge of Le Panier, with a terrace and balconies overlooking the port, Hermes is close to both the history and maritime museums. In the same location, Hotel Bellevue has a terrace restaurant and some rooms overlooking the port. Europe Hotel is one block off the harbor, near the ferry landing and restaurants. See the Sights of Marseilles: For a balance between attractions on land and at sea, consider the Provence Sightseeing Tour: Marseille and Cassis Calanques Cruise. This six-hour tour begins with a scenic 45-minute drive along the Route des Crêtes to Cassis and includes a stop at a panoramic lookout with superb Côte d'Azur views. In the Provençal fishing village of Cassis, you can explore the picturesque harbor and enjoy a 45-minute cruise to see the famous calanques, or rock formations off the coast. End your adventure with a tour of the historic highlights of Marseilles. This is a small-group tour, with a maximum of eight people for a more intimate atmosphere, and includes transportation in an air-conditioned minivan and a boat ride. Provence Day Trip: If you want to experience the tastes, sights, and sounds of Provence, the Best of Provence Day Trip, is a great way to do it. This full-day adventure takes you to explore Avignon, the "City of Popes;" the famous village of Châteauneuf-du-Pape, where you can tour a chateau; and the medieval village of Les Baux de Provence, perched high on a hilltop. Round-trip transportation and an experienced guide are included. Luberon Day Trip: Lavender fields, quaint villages, and rugged mountain terrain are the highlights on the Perched Villages of the Luberon Day Trip. Start this nine-hour excursion with a scenic drive through the beautiful Luberon River Valley to see several charming medieval villages and continue to the 12th-century Sénanque Abbey and Lavender Museum in Coustellet. The tour includes round-trip transportation from Marseille's port and an experienced guide. Although Marseilles is often omitted on tourist itineraries, this urban metropolis is in the heart of Provence, one of the most popular vacation destinations in France. An idyllic pastoral landscape, picturesque coastline, and quaint fishing villages like Cassis are within easy reach and are ideal for day trips. Other must-see historic towns include Aix-en-Provence (30 kilometers away), Avignon (100 kilometers away), and Nimes (120 kilometers away). 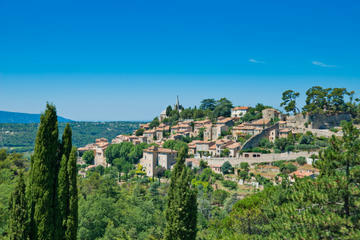 Slightly further afield (an hour's drive) is the unspoiled countryside of the Luberon region in Provence's Haut-Vaucluse, dotted with ancient abbeys and hilltop villages. For a seaside holiday, the nearby coastline beckons with sunshine and beautiful Mediterranean scenery. The quintessential port town of Toulon is about an hour's drive away, and the charming old fishing village of Saint-Tropez, with its beautiful beaches, is a two-hour drive. Continuing along the gorgeous Cote d'Azur (French Riviera) are the glamorous resorts of Cannes, Nice, and Monaco, must-see destinations for those who appreciate fancy beach clubs, upscale hotels, fine dining, and art museums.